Located just outside the walls of the world famous Kew Gardens, in Kew, West London – this unique bed & breakfast makes the perfect accommodation when visiting London. Vintage Lodgings is a self-catering studio apartment individually designed in a retro 1930’s style, complete with authentic décor and furnishings. Staying here is a quintessentially English experience. Other unique details include a luxurious roll top bath, fresh linen and towels – and delicious breakfasts and lunches served downstairs in the world famous ‘The Original Maids of Honour’ restaurant and bakery. 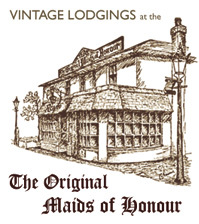 The ‘Original Maids of Honour’ boasts a history almost as long and colourful as the area that surrounds it. Established in 1837, the original Victorian building was bombed in World War 2 and rebuilt in the 1940s. Today, the newly refurbished rooms in the original family quarters now serve as boutique accommodation for traditional British holiday break with style. More information about The Original Maids of Honour is here. Breakfast in the ‘Original Maids of Honour’ is included. Additional child’s bed or cot available. Well-behaved pets welcome.